For two teams (and millions of fans) the Super Bowl is the holy grail of a football season filled with thrilling victories, stunning upsets, and end zone dances you just can’t un-see. So why relegate the biggest game of the year to some random living room or a man-cave that hasn’t seen the light of day (or a vacuum cleaner) for months on end? Instead, consider two Houston area entertainment destinations—Bowlmor and Bowlero—that’ll be ready to roll for this year’s big game. Put the “bowl” back in Super Bowl and kick off your party by contacting Bowlmor and Bowlero’s rock star party professionals. Win or lose, these two unique game day venues will make your Super Bowl experience one to remember. Sure, sitting on your couch may be considered by some to be a classic Super Bowl Sunday tradition, but if you really want to bring your party to life, then it’s time to watch every big play while you play. Experience this year’s Big Game on the lanes with a group of your closest friends at Bowlmor Houston and the Woodlands’ very own Bowlero, and enjoy sleek blacklight bowling, comfy lounge seating, and laneside service that lets you focus on fun instead constantly refilling the chip bowl. 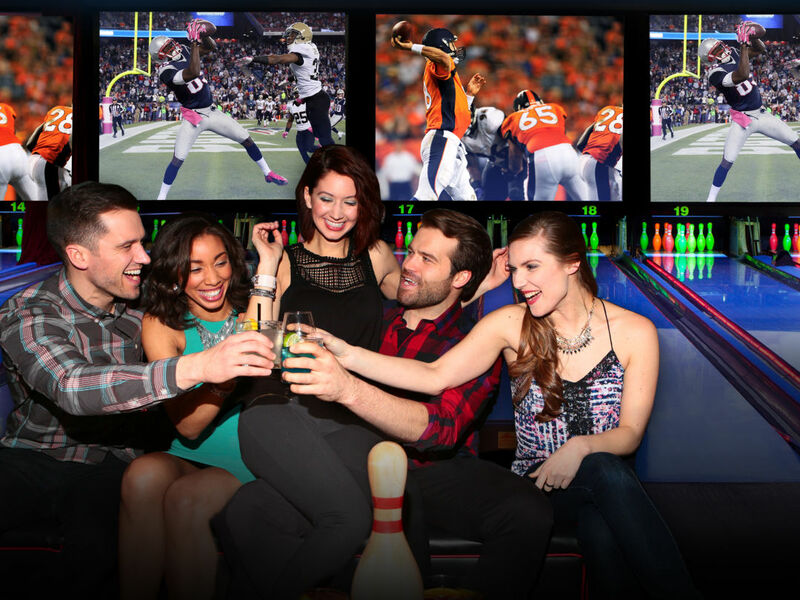 Watching a football game at a bowling alley may seem like at an odd choice—until you discover Bowlmor and Bowlero’s massive laneside video walls which bring every exciting play to you in vivid HD video. For those diehard super-fans who simply cannot miss a moment of the action, each venue’s high-end sports bar features huge flat-screens that broadcast the game, providing patrons with a seamlessly uninterrupted sports experience. Or, you could really take your party to the next level and rent out Bowlmor Houston’s private bowling suite—a separate bowling lounge comprised of seven VIP lanes and its own private bar. For more casual observers, each venue also offers a variety of other amusements in addition to bowling, including billiards and interactive arcade games that transport guests to an epic new world of fun. And if you’re really feelin’ all the energy and excitement of Super Bowl Sunday, you can even test your QB skills and challenge your friends on Bowlmor Houston’s Two-Minute Drill—a football arcade game that features an interactive playing field and pop-out targets. It’s the perfect opportunity to channel your inner Troy Aikman… from the 1990s. Of course, no Super Bowl celebration is nearly complete without a killer menu of outrageous game day eats. This is where Bowlmor and Bowlero really begin to shine. Each venue’s party menu comes packed with a ton of incredible options. There’s the pizza cake, a nine-inch-tall fusion of mozzarella, meatball, and pepperoni; two-foot-long Coney “Mega Dog” hot dogs; flavor-charged pizza cupcakes (yes, you read correctly); and the larger-than-life Behemoth Burger—a five-pound, 14-inch-round party burger that’s perfect for Super Bowl parties and made for sharing. Feeling thirsty? An all-star selection of drinks, including a wide variety of beer, wine, and specialty cocktails, are also available to help raise the spirits of your party guests. Best of all, every one of these signature drinks and incredible, party-ready eats are delivered straight to your lane thanks to Bowlmor and Bowlero’s convenient laneside service; it’s a total game changer for anyone hosting a Super Bowl celebration in the Houston area. No matter whether your team clinches a victory or accepts a heartbreaker of a loss, this Super Bowl Sunday your party will still be a total win thanks to the stellar menus, skilled event professionals, and signature amusements you’ll find at Bowlmor Houston and Bowlero, The Woodlands. Don’t wait for game day—start planning your party today!